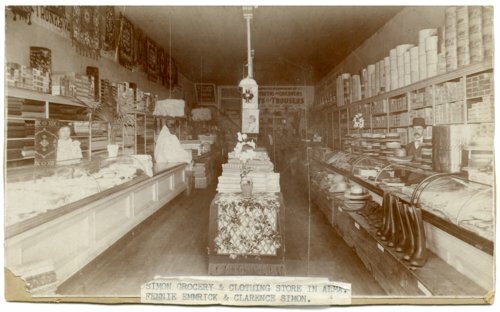 This interior view of the Simon Mercantile shows a wide variety of merchandise from shoes to hats, fabric, rugs, and grocery items. Identified at left is Fennie Emmrick and at the right counter is Clarence Simon. The store was located at 109 Missouri Street in Alma, Kansas.